This June, the National Outdoor Leadership School's (NOLS) Expedition Denali, made up of predominately African Americans, set out to climb the highest peak in North America, Mt. McKinley (also known as Denali). The group aimed to inspire minorities to get active and get outdoors. Andy Adkins, pro-filmmaker and novice climber, was there to capture the journey. Our company, Distill Productions, was hired to do a promotional piece. We were at the NOLS headquarters the first time all nine climbers came together. After shooting a bunch of interviews and getting to know the team, we realized this could be an awesome project. Another producer, George Potter, and I spent the six-hour drive home talking about how to make it work. It was a crazy few months of preparation. George and I were in decent shape, but we had to start training though we weren't sure it would all come together. The Kickstarter funds only came through less than a month before the climb. Of the climb itself, the endless logistics and prep still left us a little unprepared for how absolutely stunning it was to actually be in those mountains. I guess if you haven't been into that landscape you can't really prepare yourself for what you'll see and you can't really appreciate it. Watching our movie will help. Were you nervous before the climb? Yeah, we were nervous. We didn't have a lot of climbing experience. We'd both lived in Montana for years. We were used to being cold. But nothing like this. How many people did you have on the media team? Four of us. 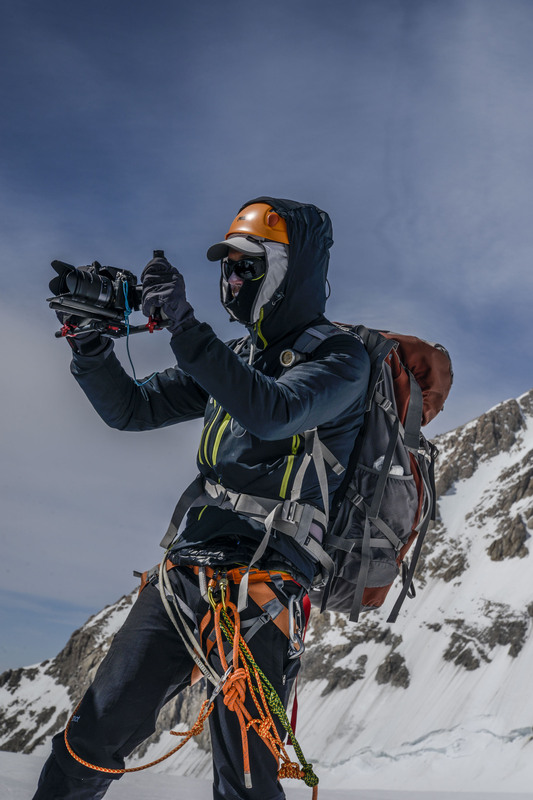 Kyle Duba, a NOLS instructor and in-house video producer, had a lot of backcountry experience. We also brought in a photographer out of Portland, Hudson Henry. Hudson and Kyle helped make up for our limited experience. Talk about multi-tasking, how do you deal with filming while climbing? As a filmmaker, you want to film everything but it's restrictive because you're bound to the norms of climbing. The single file, roped-up march doesn't lend itself to filming much of the team. It's like being on a train track and you're the caboose. You have to jump off to the side to get the shot. Two NOLS guides with us, Gary McLaughlin and Maggie O'Brien, were really amazing. They did a lot of extra work to allow us to get shots. We shot a lot of footage of people being exhausted while we were exhausted. Everything I'd read said, 'it's a grind.' I expected to be exhausted, sore, sunburnt, hungry, possibly sick and very, very cold. But I didn't expect to be scared. We witnessed frequent rockfall and a pretty massive avalanche that looked like it could hit my rope team. Then, of course, we had the lightning. [A freak electrical storm forced the team to turn back close to the summit]. On the walk out, we skied over unbridged crevasses. You couldn't see the bottom. I'm a little bit spooked by heights, I guess. Any time you have to crap in a bag for three weeks, there's going to be some comedic moments. Let's not name him, but we had a member of our team fall into a latrine. I got to be the one to pull him out. Shooting nine climbers was its' own challenge. We had to design a custom solar setup to charge batteries. Editing the project is a whole other thing. Any time you're dealing with race stuff, it can get touchy. When you climb Denali without making a film you are already at or near the edge of several physical limits; weight, time, calories and energy. We were essentially embedded with the main team -- same route, same schedule for the most part, adding 80 or so extra pounds of film gear to the mix. Two members got sick on the climb. What happened? Hudson and I got it pretty bad. I had it first and probably gave it to him. Passing pathogens around is actually a pretty big problem on these expeditions due to close quarters and limited sanitation opportunities. Mix in the whole shitting in a bag thing and it's pretty risky business. Needless to say hand sanitizer is standard issue. But the nice thing about it being a long expedition is that I got over it and came back strong. What was on your mind while climbing? I was a few steps in front of John Krakauer the day we set out for the summit. On one of the sketchier sections, I wondered if I would end up in his next book if I fell. Why do you think so few African Americans take part in the outdoors? The outdoors can be intimidating for anyone. The Expedition is focused on a group that doesn't often see people like them in outdoorsy catalogs. Often, it's just a bunch of white people. We're trying to make climbing a little more accessible. Were you disappointed that you didn't reach the summit? The challenging parts were behind us, I'm 100 percent confident that everyone would have summited had the weather not closed in. That's almost unheard of in a group that large. Personally, before the trip, I thought there were high odds I wouldn't make it past the 17k or 14k camp. Our film team had made contingency plans for only one or two of the four us to summit so we were all incredibly happy with how well we performed as an expedition. I think all of us getting to where we got is a much bigger collective feat than just a few of us summiting. Of course, when it's that close, a tiny piece of you regrets not making it all the way. Is the film what you expected? In a project like this, you don't always know what you're going to get. It's hard to say what my expectations were. The mission of the film is very close to the Expedition's mission, "To inspire youth of color--and particularly African American youth -- to get outside, get active and become stewards of our wild places." None of us expect to suddenly catapult everyone outside. We just want to move the needle a little bit. How does not summiting affect the film? From a storytelling perspective, that's a really interesting question. It makes the payoff more nuanced and difficult to put into perspective for the audience. But that complexity could actually make for a more interesting story. Simple endings are often not the most compelling. It would be easy to just let the music swell on the summit shots and stick to convention. This forces us to innovate. Are you going to continue climbing? I don't see myself doing a lot of huge climbs. I have a wife and daughter. That was the hardest thing about being away. I talked to them on the phone, as we were about to go out to the glacier. It was emotional. People do die up there, it's not common, but it happens. I'll probably stick with climbs that take a few days rather than a few weeks. How did things change from the beginning of the trip to the end? They call it a team for a reason. You're all putting a lot on the line together. We got a chance to form bonds that we don't normally form as adults. The danger, the excitement, it all combines into an amazing experience. I've thought about it every day since.